Happy Monday to you! This weekend was all about cleaning and relaxing for me. I did something a little differnt with my hair (pics below) and I also pulled out most of Christmas decor. While relaxing, I made time to catch up on my Netflix watching, as well as my reading. As I mentioned in this post, I’ve become a huge fan of audiobooks lately. It’s just makes it so easy to read these days. During the car ride to Delaware for Thanksgiving, I was actually reading an audiobook. I’m addicted! With the new year approaching, I’m looking forward to using (and subscribing to) Audible. This audiobook site is absolutely perfect for every occasion and event throughout the year. You can even gift a yearly subscription to the book lover on your list. Talk about the perfect gift! Not only are audiobooks perfect for book lovers like me, but they’re also great for children. My tween sister does a lot of traveling for pageants and acting, so something like an Audible yearly subscription would be perfect for those long car, train or plane rides. Right now, you can check out Audible’s gold offer for a chance to save 50% off! This offer gives you the first three months of your subscription for only $7.49, which is half the usual price. There are also several Audible coupon codes and other ways to save as well. Are you convinced, like me, that Audible is the way to go this year for audiobooks? What are some books you’re looking forward to reading in the new year? Oh yea, what do you think about my outfit and hair style too? 😉 Let me know! Before I go, be sure to check out this amazing Audible giveaway me and a few other lovely bloggers are hosting below! 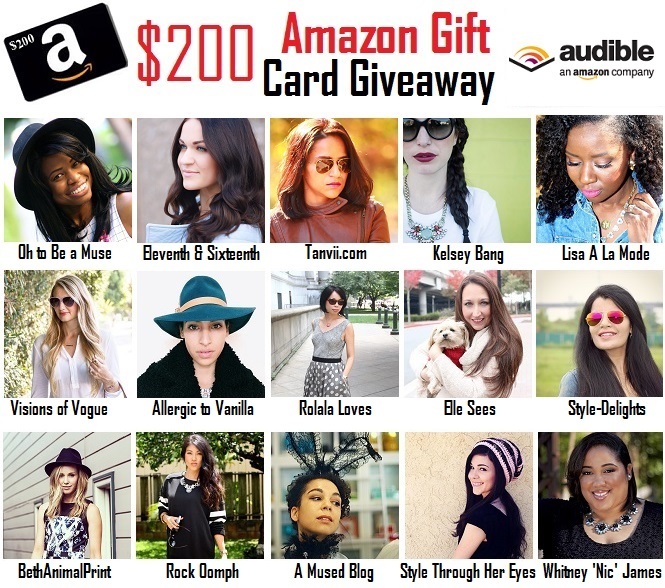 One winner will receive a $200 Amazon gift card! FYI, Audible is an Amazon company. This giveaway is only open to U.S. residents and will run from December 8th – December 12th. Until tomorrow, stay blessed and be safe…XO! P.S. Don’t forget to linkup your recent OOTD to my Personal Style Linkup! Loving your open front sweater! The silver and gold details take it over the top! Cute hair style as well! 🙂 Thanks, Robyn! This sweater is an all time fave! 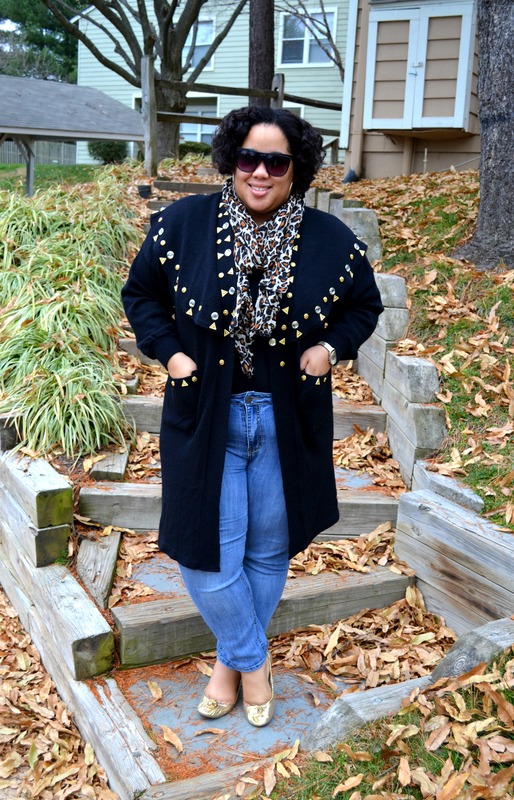 I love the curly hair and the embellishments on your coat! Thanks, girlie! I think I’m feeling the curls too. Sis! That sweater is everything. Love it! Lol, thanks Ash! It’s an oldie but goodie. Had it for years! Love your outfit. What a cool coat. We have an upcoming trip over Christmas that I just might need to get an audio book for. Good tip! Thanks, Amy! An audiobook is definitely perfect for a long trip! I absolutely love your hair girl! The curly look suits you well! 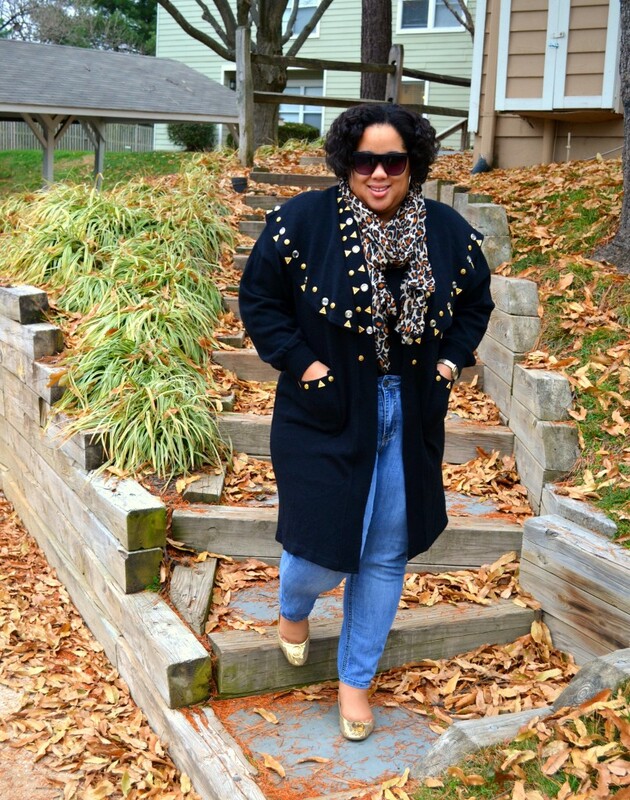 I also love what you are wearing, from the coat to the lovely leopard print scarf! Oh my goodness, I’ve been obsessed with audio books lately too! I’m always on the road, mostly on my own, so it’s great to be able to listen to a book. And I loved it so much that I started also listening to audio books while doing chores at home, it’s so great! 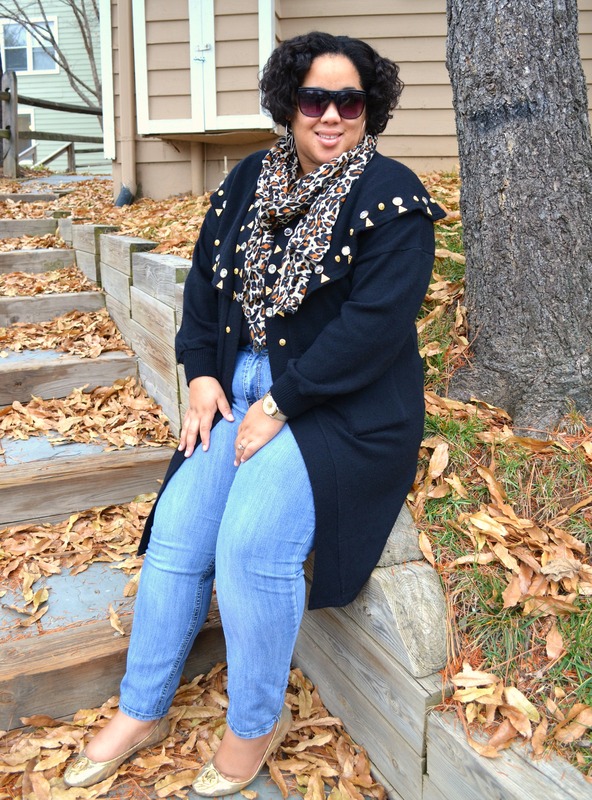 Love the leopard scarf and gold flats. Great detailing on your top!! 😉 Thanks, Glenda! I’m always delighted when you stop by and comment. XO! That coat is fabulous, my friend! You look great! You look fabu, I need to find a new winter coat because the hawk is calling! Enjoy the rest of the week lil sis. Aw, thanks sis! And yes, go get you a winter coat…please. Stay warm! What a gorgeous coat and fun lapel. Love your new hair too! Thanks, Lydia! This is one of my all time favorite thrifted finds! That sweater looks super cozy. Very nice find! Fab as always. It is really warm! Thanks, Troy! Your embellished sweater is super cute Nik. Love how your paired it with the leopard scarf. Fashionably Fabulous hun. I LOVE AUDIBLE! I get through a book so much faster listening rather than sitting still and reading! Such a great deal! I agree, Toya. I feel like I’m speed reading with audiobooks, lol! Love this cosy outfit and your gold shoes. So gorgeous. All I can say is, that coat is pretty badass.